Millennials are the largest living generation in the USA, weighing in at an astonishing 92 million people. By 2025, Millennials will make up 40% of eligible voters and 75% of the global workforce. Their sheer size and unprecedented influence have disrupted every status quo impacting the world around us. 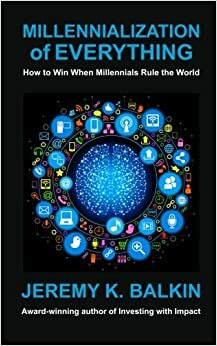 Award-winning author Jeremy K. Balkin refers to this phenomenon as the “Millennialization of Everything.” Socio-economic and historical events have fundamentally shaped the Millennial Mentality and their preferences and behaviors. Debunking commonly held stereotypes and understanding the Millennial Mentality are critical to harnessing the power of their best traits and unlocking future trends. Only then can we effectively engage, motivate and empower the most important generation in history.